DOZENS of people attended the Mayor of Henley's civic service at the bandstand on Mill Meadows on Sunday. The event, which usually takes place at St Mary's Church in Hart Street, was moved to the riverside beauty spot by Mayor Kellie Hinton as she wanted it to be more accessible. Guests sat in rows of chairs in front of the bandstand and sang hymns including Morning Has Broken, Give Me Joy In My Heart and Lord Of The Dance. They included members of the public, Henley town councillors and a number of civic dignitaries including the Mayors of Didcot, Witney, Farringdon and Bicester and Dr Kate Tiller, Deputy Lieutenant of Oxfordshire. The Mayor gave a reading from the Book of Phillippians and Rev Canon Martyn Griffiths, the rector of St Mary's, delivered a homily. The service concluded with a recital of the National Anthem. Afterwards, visitors enjoyed cold drinks and cakes served by Henley Town Council staff. 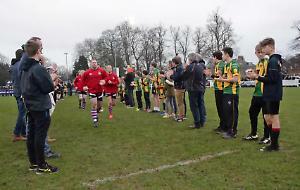 For the full story and more photographs, see this week's Henley Standard.